Ductless Fume Hood provide protection to both laboratory personnel and the environment from toxic fumes. Ductless fume hoods are considered as independent systems that do not require connection to the extraction systems. Unlike conventional fume hoods, these hoods filter out chemical fumes and recycle air directly back to the laboratory, providing energy savings, personnel and environmental protection, convenience as you do not have to deal with complicated ducting systems, and mobility, since ductless hoods are independent systems which do not require connection to extraction systems. With a Ductless Fume Hood it is essential that the filter medium be able to remove the particular hazardous or noxious material being used. As different filters are required for different materials, recirculating fume hoods should only be used when the hazard is well known and does not change. Microprocessor control system with audible and visual alarms for unsafe conditions. VOC sensor to monitor chemical concentration within the cabinet work zone.(optional). Centrifugal Fan: Permanently lubricated fans are energy efficient with external rotor motor design that reduces operating costs. Extremely low noise and low vibration level. Arm Ports: allows easy access to work zone without risking exposure from chemical fumes. Work Top: Spill-retaining work top designed with a recessed central area contains accidental liquid spills. Ductless enclosure is a safety device used to protect laboratory workers when handling chemicals that pose an inhalation risk. Air from the laboratory enters the hood through ergonomic openings. The air face velocity creates a dynamic barrier between the user and the chemicals being handled. The device ventilation system draws the particles and any molecules that have evaporated in the hood toward the filtration system. The level of containment provided by the hood prevents any pollutants from being released into the laboratory. The filtration technology customized to the application traps the molecules that have evaporated within the enclosure. The discharged air is free from all pollutants. 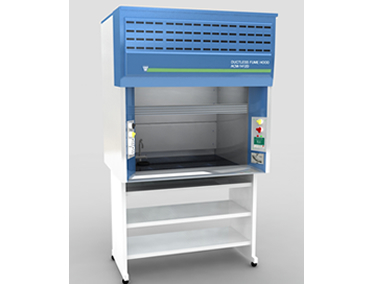 Fume hoods are developed and designed to be used as semiconductor ventilated enclosures so as to protect the user from harmful and toxic fumes and vapors and to eliminate the possibility of accidental fire which may lead to emission of inflammable gases during the course of experiments. Hence, the materials of fume hoods are carefully chosen between industrial grades fire resistant thick PCRC, pre coated corrosion resistant GI sheet. The work table is made of heavy gauge construction material fortified with acid proof glazed tiles/stainless steel grade ss-304 grade. The work bench is provided with a small made of stainless steel ss-304 grade. All modular fume hoods are provided with sliding sash made of special grade shatter proof glass duly framed in wooden/ aluminum frame with sliding motion and counter weight balanced mechanism. Our stainless steel ducts less fume hoods are designed with lower noise levels and the performance of these fume hoods are comparatively better than the industry standards of 60db, and approximately 15cm distance from the sash. Our versatile fume hoods make sure that a maximum of 800 lux light is available on the work table through diffuser fluorescent light arrangement. Flow monitor This device monitors the air flow and ensures the user that the fan is working properly. This timer counts down the running hours of the unit and informs the user after every 60 hours of use a to perform a saturation detection test of the molecular filter. Located on the enclosure side panels, they allow the passage of power cables/fluid pipes in the enclosure without discomfort for the user.